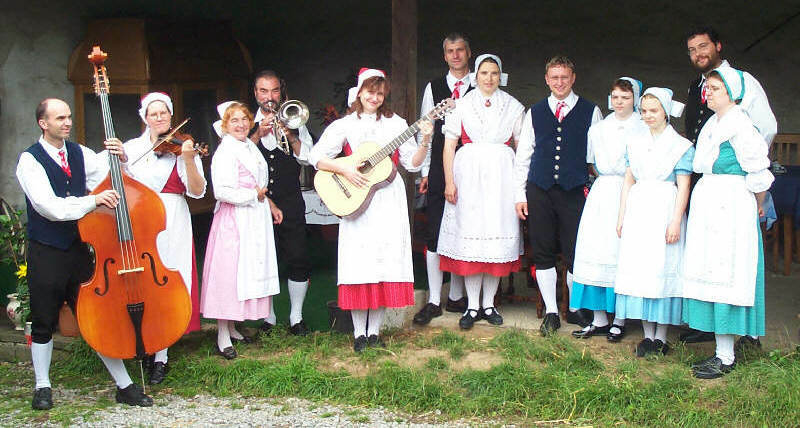 Our name can be translated as "the merry circle", which describes us quite well since we are a group of young adults and teenagers who enjoy folk dancing tremendously. At the same time it is the name of one of our favourite dances known to the English-speaking folk-community as "The Circassian Circle" . The group is more than ten years old and developed from a children-dancegroup in Leverkusen. 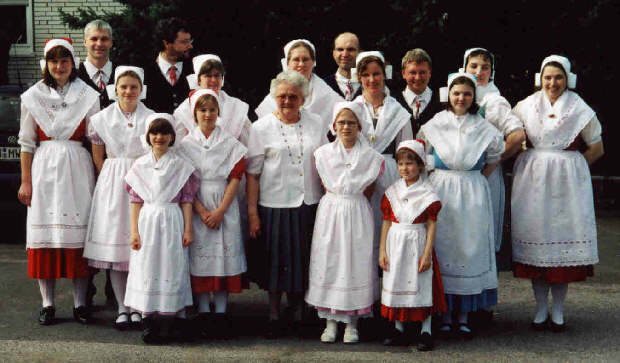 Our traditional dresses (which we would rather not call costumes since they stem from the people's traditional wear and not from carnival etc...) are what farmers in Lower Silesia ("Riesengebirge") wore for church, for festivals and dance. Not for everyday use, obviously, since the famous embroidery on aprons, shawls and bonnets is very labour-intensive. We call it the "White line" when all the girls wear this dress. 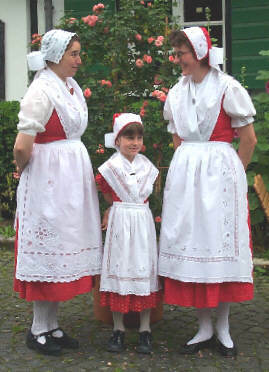 For special occasions we have another set of dresses from different regions. 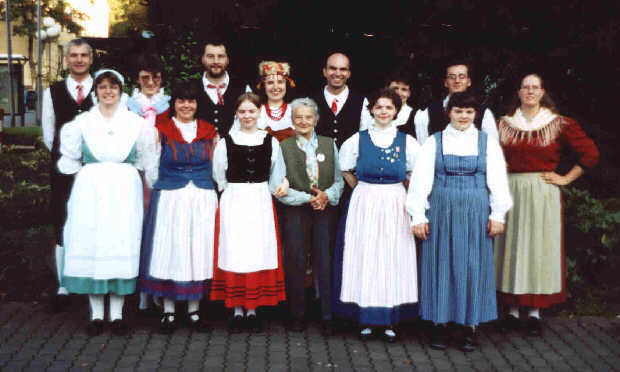 Several of our members own dresses from different regions in Silesia, but also from Salzburg (Austria), Slovakia or the river Mosel that were sometimes passed on in the family for generations. This way our "Coloured line" gives us the opportunity to show some rarities. We dance according to the dance descriptions recorded in historic documents, not altered for show effects. Thus we can dance with other groups anywhere in the world. Our favourite dances are Quadrilles, dances for four couples with a fixed order of dance-elements. Other complex dance-suites and dances for more than four couples complete the repertoire. 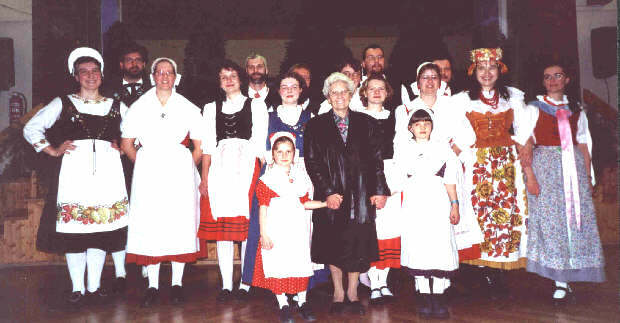 Most of the dances are from all over Germany with a stress on our immediate neighbourhood, e.g. Rheinland, Sauerland, Westfalen. Of course we dance other European dances (from the Balkan countries, from England etc..) or from the United States as well: folk-dancing does not recognize borders, just the common language of music. Most of our performances are on occasions like church festivals, birthdays, Thanksgiving, town-festival, receptions, weddings or in old-age residencies. One of the highlights was the participation in the TV show "Dance RTL" where we got the opportunity to shoot our own dance video which was then presented in the TV show. It was a pleasure as well to dance at the opening of a Venetian Glass Exhibition at the Chamber of Commerce in Cologne. We wore baroque dresses and showed courtly dances like Menuett and Pavane beforer changing into our Silesian dresses to dance some typical "Rhine-area" dances. We had a small appearance at the German TV series "Das Amt". The episode with the title "Hagen Furioso" was broadcasted in January 2002 on the TV channel RTL. Last but not least the Europeade, a folk dance and folk music festival with more than 5000 participants from approx. 170 european regions was a memorable event. Have a look at our diaries Zamora and Antwerp with many pictures. During five days we danced for a very receptive audience, met other groups and had a lot of fun among so many fellow dancers. We hope to be a part of the next Europeades, too.